Though not DC's oldest Japanese restaurant Makoto carries itself as if it were the grande dame of Japanese cuisine projecting a reserved stately air and expecting the same of its diners. Now California features its share of sushi nazis who will kick you out for ordering the wrong thing or a myriad of other faux pas. Makoto seems different, expecting a level of etiquette from its diners but at the same time I got the feeling it would take a lot to get kicked out. The restaurant features the strictest dress code of any Japanese restaurant I've been to, t-shirts, jeans, and sneakers are verboten and jackets are recommended for men. When guests arrive they first enter an antechamber where they trade their shoes for slippers and are asked to turn off their cell phones. After being yelled at by the chef at Sushi Wasabi, I've developed a new appreciation for asking for permission to take pictures. The staff seemed a bit dubious at my request but acquiesced after a momentary pause, asking that I only take pictures of the food and not the kitchen, decor, or other guests. The dining room is almost entirely wood paneled with a long bar behind which two chefs prepare both sushi and cooked dishes. Along the back wall are a couple of tables good but as with any good sushi restaurant the best seats are at the bar. The general feel is similar to Urasawa but Makoto is decidedly more rough-cut, lacking the immaculately smooth wood and ultra-refined feel. Though much of the focus seems to be on the restaurant's sushi, the best way to experience all that Makoto has to offer is with the multi-course dinner which actually features very little sushi. 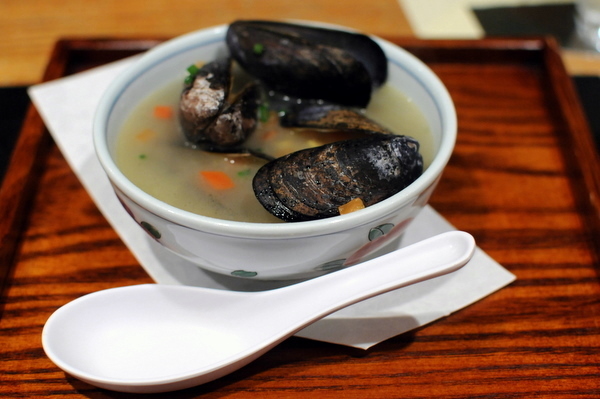 The meal started with a stock composed of vegetables and mussels cooked in sake. The rice wine took the briny edge off the bivalves leaving a slight sweetness that augmented the smoky flavor of the vegetable broth; an unexpectedly robust soup given the components that went into it. 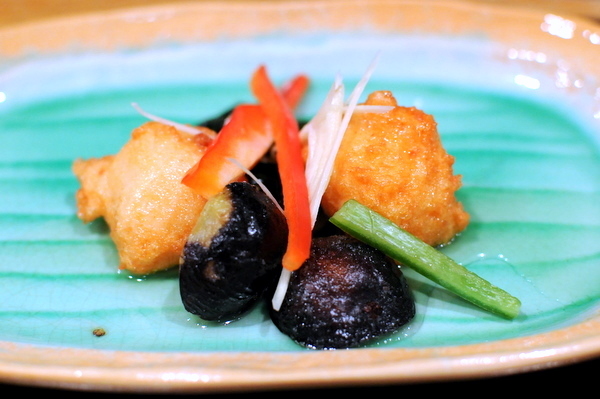 The next course featured an unusual duo, fish cake and fig, that was lightly fried, tempering the unique flavor profiles and giving the dish a uniform umami cast. 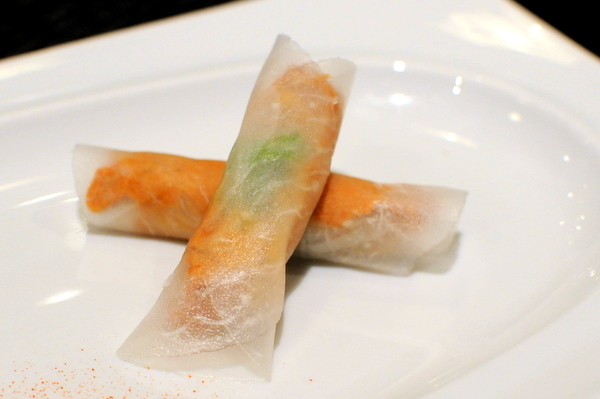 A smattering of vegetables and a thick sweet yuzu sauce helped encapsulate the disparate flavors nicely. 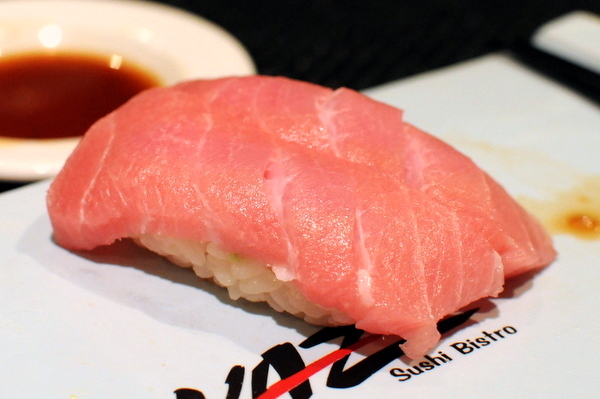 The toro was presented in a beautifully minimalist style, drawing the eye to the cream colored veins threading through the vibrant pink flesh. The fish itself is tender without a hint of gristle though I would have appreciated a more pronounced fattiness. 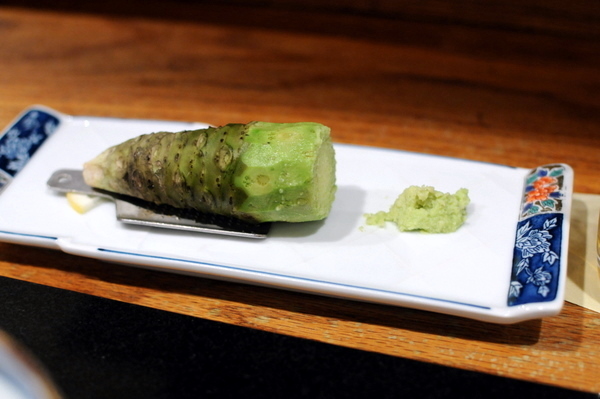 The toro is paired with freshly grated wasabi and diners are given a piece of the root and a grater in case they desire more. 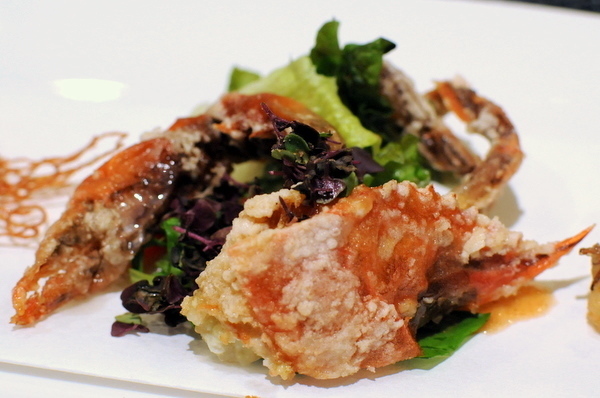 My initial experiences with soft-shell crab were at sushi restaurants though since then I've found Western presentations more to my liking due to the added emphasis on pairing complimentary flavors with the crustacean. 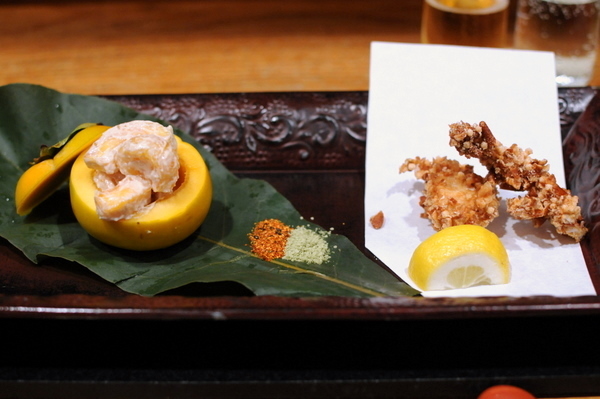 Here the crab is coated with hard bits of rice cracker giving it a malty grain flavor and drawing attention to the glassy bits of shell, exactly what I didn't want. The dish also featured diced persimmon coated in some sort of thick sauce that didn't compliment the crab in the least. Despite that I found the fruit quite palatable for someone who normally arbors it. The salad course was the only blatant miss of the night. 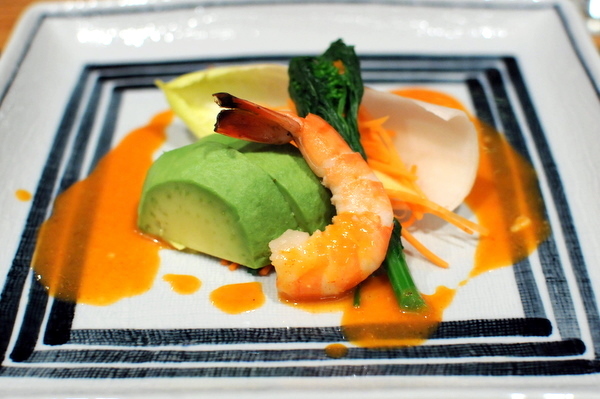 Featuring avocado, shrimp, endive, carrots, and a chili sauce, the dish was a mishmash of sweet, vegetal, and spicy that grated on the palate. 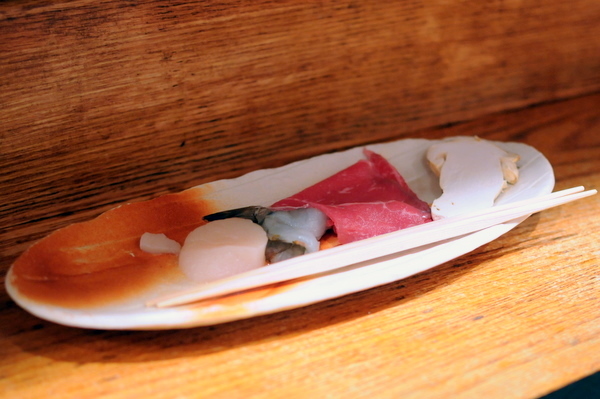 The ingredients of next course made me think of the shabu shabu course at Urasawa though the similarities ended there. 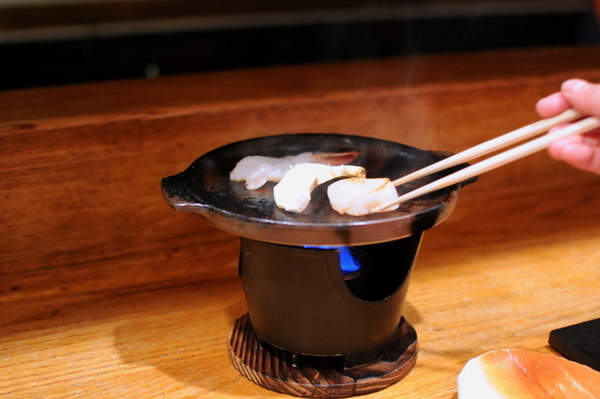 The cooking style was markedly different with the raw ingredients grilled on a hot ceramic skillet before being dunked in a bath of ponzu, radish shavings, and scallion. Aside from the aromatic woodiness of the Matsutake mushrooms, the other ingredients all suffered from a distinct lack of flavor; texturally wonderful but utterly bland, a far cry from Urasawa where the meats seem to drink in the wonderful flavor of the cooking stock. 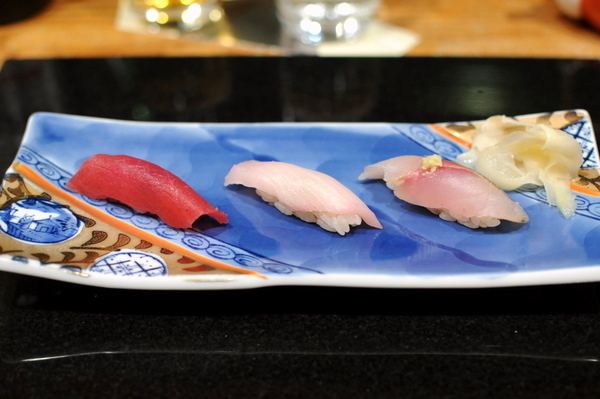 Typically with set menus the sushi course tends to feature a more exotic selection from the restaurant but here I was presented with a trio of classic fishes: Maguro, Hamachi, and Aji that were solid but unremarkable. 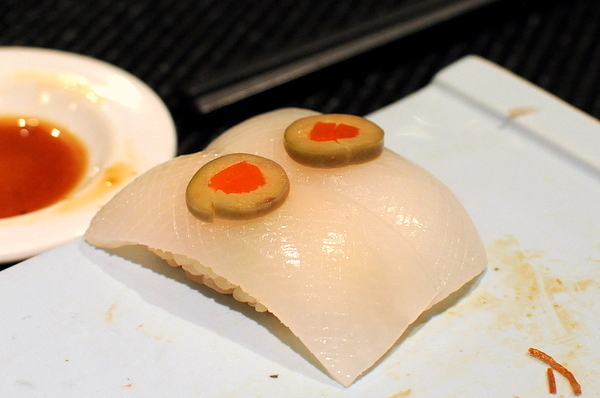 In fact, the most memorable aspect of the fish was how tiny the pieces were, about the size of my little finger. I immediately asked for a sushi menu feeling that this hardly qualified as a course. I selected Orange Roughy for my main course of the evening. I recall having the fish once or twice in my youth and seemed to remember it standing up well to grilling. Indeed the fish lived up to my memories, with a delightful char that added a slightly bitter sweetness to the buttery flavor of the fish. The sprig of frissee provided an effective foil to the heavy flavors of the fish. 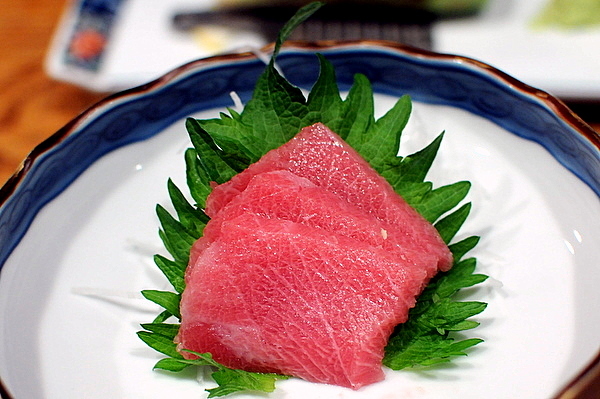 Despite offering a complete array of cooked dishes the restaurant's claim to fame lies with its sushi; therefore, given the minuscule size of the sushi course I felt a more thorough tasting of Makoto's raw fish was in order. 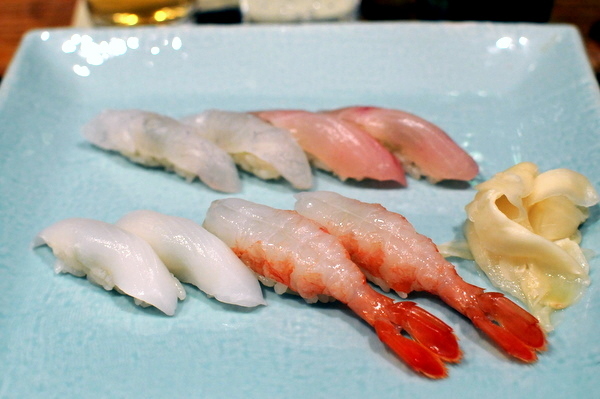 For my second round I chose a selection of less common nigiri. Again the sushi was solid, but the small size simply felt unsatisfying. 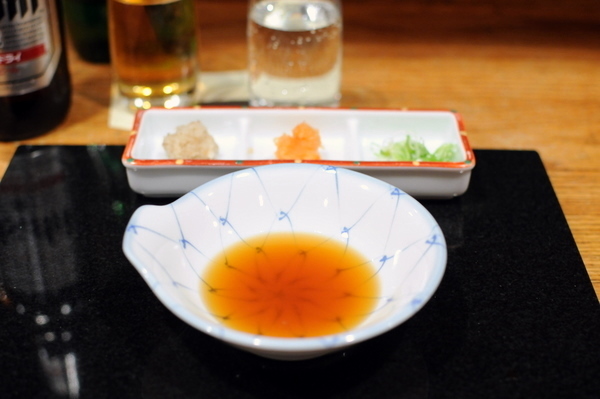 The second of the two choices diners have to make is the type of topping for the soba. The choices include: wild vegetable, seaweed, mushroom, grated radish, grated yam, or natto. 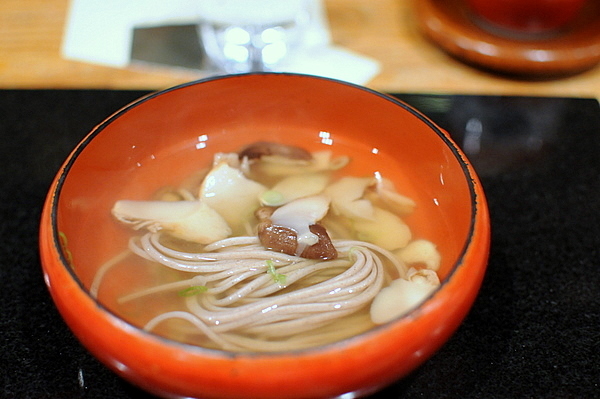 The soba itself was impeccable, but the broth was completely devoid of flavor; even the cooked mushrooms added very little, making this an utterly boring dish. Perhaps the earthy wild vegetables would have been a better pairing. 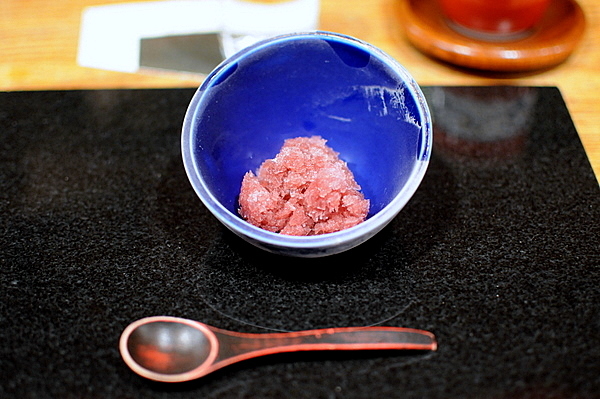 The grape Grand Marnier sorbet was so thin and watery that it felt more like ice chips with flavor and coloring than a true sherbet. At least it came with a cup of hot tea which provided a soothing end to the meal. Makoto is an interesting beast for me. On the plus side, the food itself was solid though I felt like it could have been so much more and I couldn't stop thinking of all the potential that went unfulfilled. At $60, the set course dinner was the cheapest of the three sushi restaurants I visited in the DC area (Kaz's Sushi Bistro, Makoto, and Sushi Taro). Despite the strength of the food, there were a number of aspects that kept me from feeling entirely comfortable in the restaurant. The decor gives a serene zen feel, but the hard backless wood chairs are difficult to sit in for long periods of time. 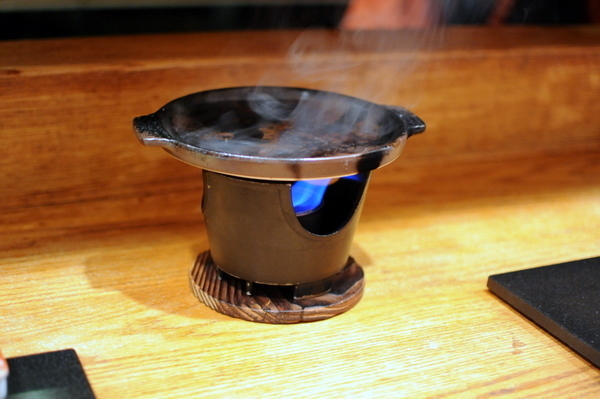 In addition for some inexplicable reason the hot food is prepared in the bar area and I just happened to be seated in front of the four burners which left me sweating by the middle of dinner. In addition, the room seem to fill with greasy smoke despite the best efforts of the ventilation system. Moreover, though the staff is attentive, I got the feeling they were silently judging my every move like a too-formal elderly relative. 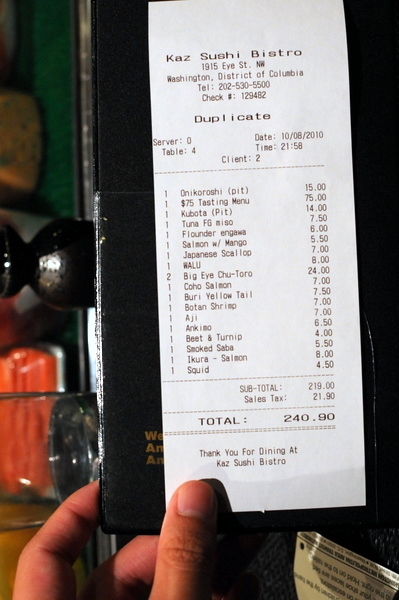 Also most sushi restaurants that feature a bar allow for interaction between the itame and the diners. At Makoto a half curtain partially obscures the view and I got the distinct impression that conversation with the chefs was frowned upon. The two chefs behind the bar moved quickly and efficiently, but there was a mechanical feel to their motions as if they were simply following a script rather than creating something they were truly proud of. Clearly the restaurant seeks to deliver an elegant dining experience though the food lives up to that aspiration, the restaurant falls short in many other respects. minibar is arguably the hardest reservation to get in DC; I literally called the restaurant over 1,000 times without ever getting through to a reservationist. With all the hype surrounding those six seats around that tiny bar it is often easy to overlook the restaurant that houses the minibar. Cafe Atlantico features "Nuevo Latino" cuisine, a contemporary take on classic Latin American cooking techniques that seems to straddle the boundaries between the avant garde minibar and some of Chef Andres' more traditional restaurants like Jaleo or Oyamel. 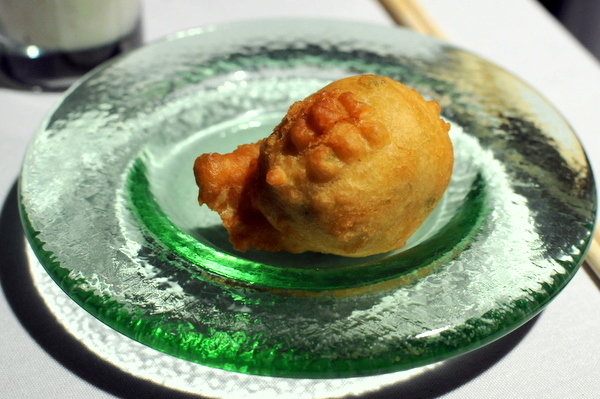 On Sunday the restaurant features something it calls "Latino Dim Sum" which allows diners to share a bevy of small plates or enjoy 14 courses in a more structured tasting menu format. 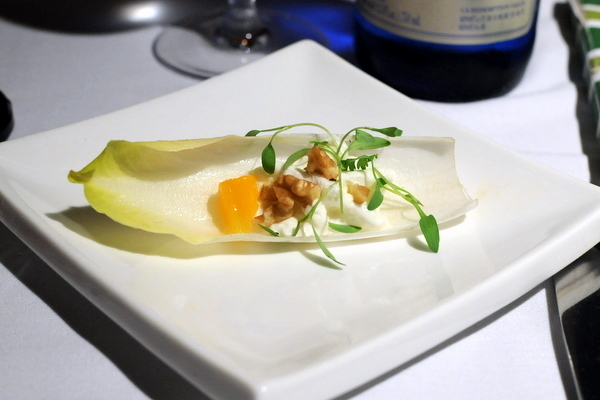 Lush and juicy, the endive was a light clean start to the meal. The bitterness of the endive and fresco is effectively tempered by the sweetness of the fruit and mellow nuttiness of the walnut. 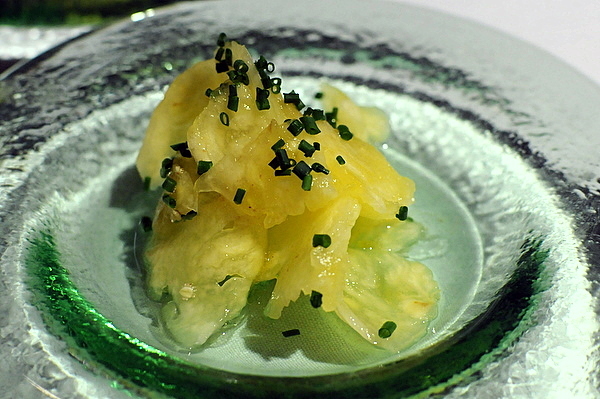 A plate with a pile of pineapple slivers wouldn't normally qualify as a course in my opinion; though I warmed to the dish, enjoying the savoriness that the corn nuts and tamarind oil added to the tang of the pineapple. I was a bit wary of combining mango with anchovy, expecting the fishiness of the anchovy to clash with the fruit. However the mousse was markedly subdued with more of a smoky hammy essence that did pair harmoniously with the mango's tropical sweetness. 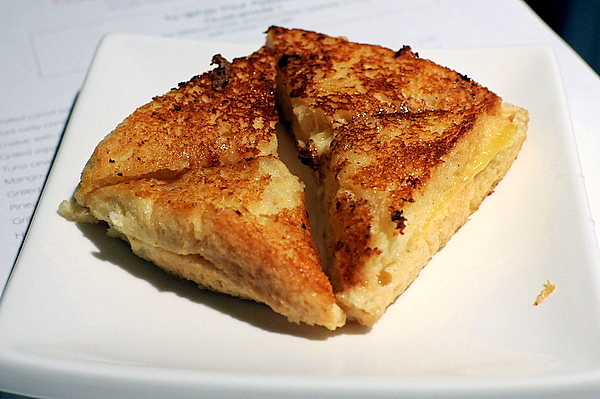 This course didn't look like much but the crispy exterior hid a center of creamy bechamel laden with a pronounced brine and a light spiciness. Though I've had this course numerous times at The Bazaar, I didn't mind seeing it again here. 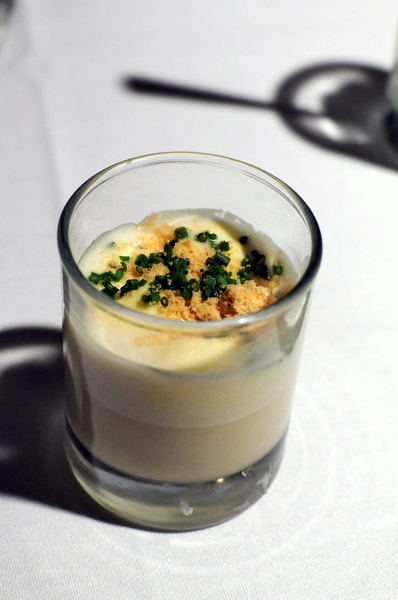 The temperature contrast and crumbled corn nuts gives a playful feel to the rich essence of the foie. 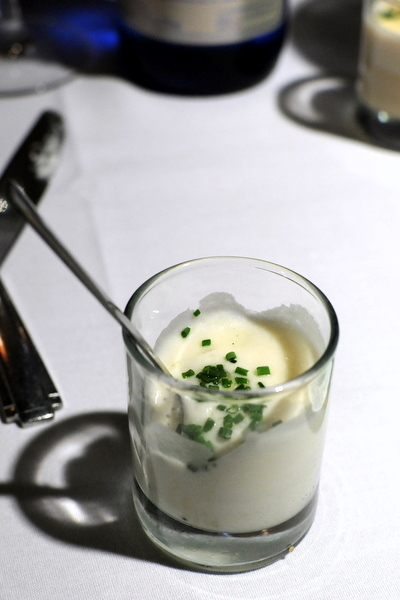 I appreciated the flawlessly smooth texture on the potato with this course, the vanilla adds a nuanced aromatic sweetness while the forceful salinity of the caviar compliments the starchy gravity of the potato. 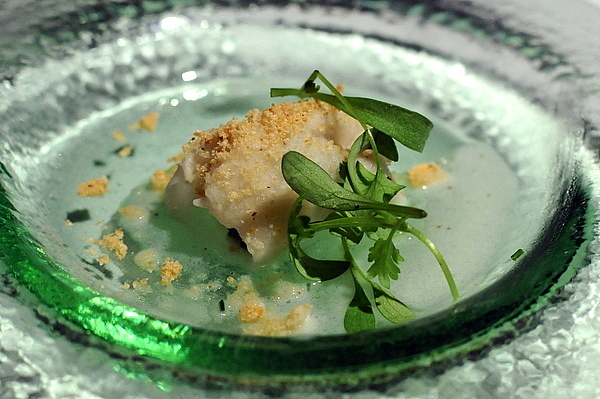 Though the meal has been solid to this point, this was the first truly spectacular course. 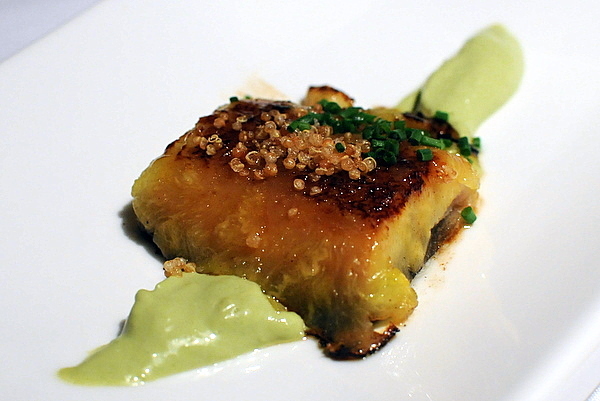 The unagi might have be the most tender succulent eel I've ever eaten and the charred pineapple adds a saccharine caramelization that substitutes for the eel sauce served at sushi restaurants. The avocado sauce is a bit off putting on its own but provides a vegetal foil to balance the heaviness of the eel and pineapple. 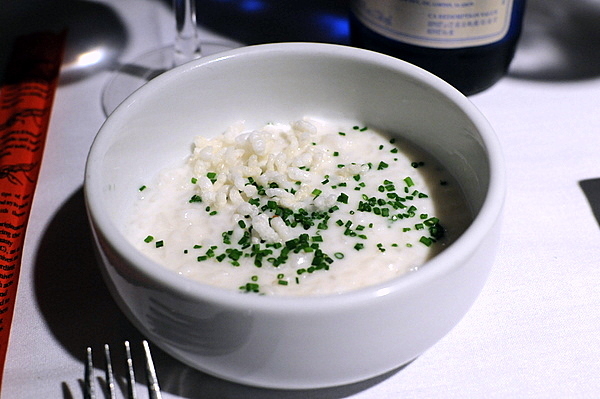 Made with Arbollo rice (a common choice for risotto) the crux of this dish was almost like a sweet congee. 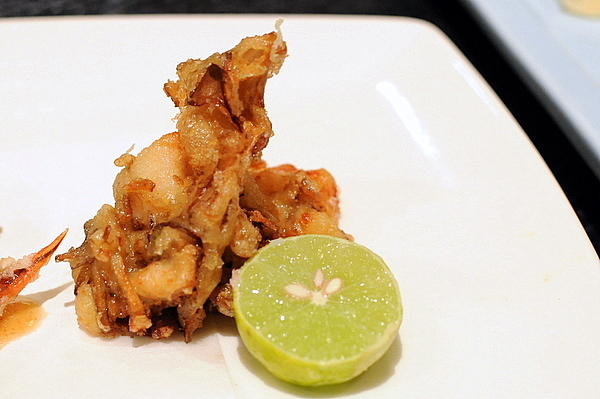 The crispy rice which was present for texture, was made by overcooking the rice, dehydrating it for three days, then deep frying it. The coconut gave the dish a mild savory/sweetness that I found disconcerting. The dish didn't have enough flavor to stand on its own and what it did have was neither here nor there. Grilled skirt steak "Carne Asada"
The courses had been getting steadily larger over the course of the meal but when I saw the plate of "Carne Asada" I was stunned. The beef was cooked rare which is a nice change from the overly dry preparations I typically have. 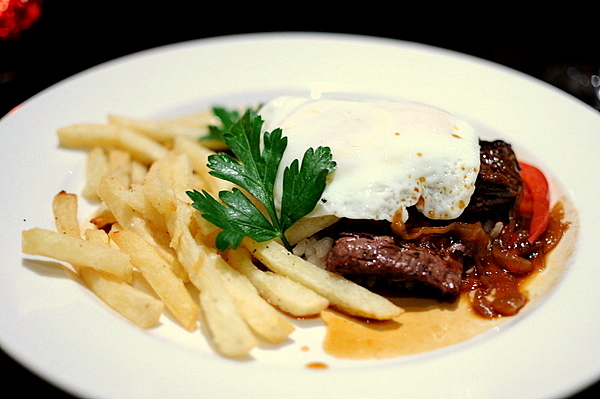 Though there wasn't much to this dish in terms of complexity which left the focus on the superlative texture and flavor of the beef. 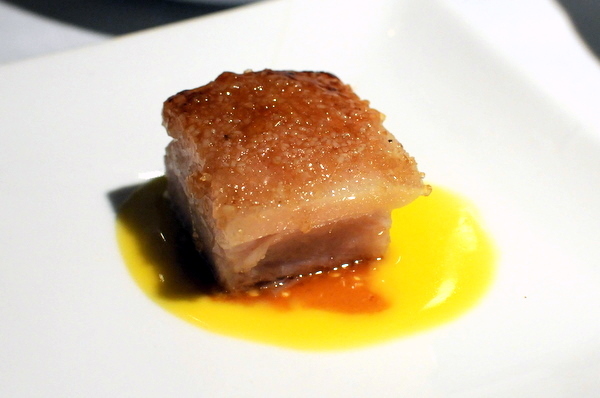 An interesting take on pork and beans, in fact the pork is all but invisible but certainly makes its presence felt in terms of flavor. I don't normally care for beans but this was exceptional, the smoky temper of the beans is augmented with the potent savoriness from the pork confit. 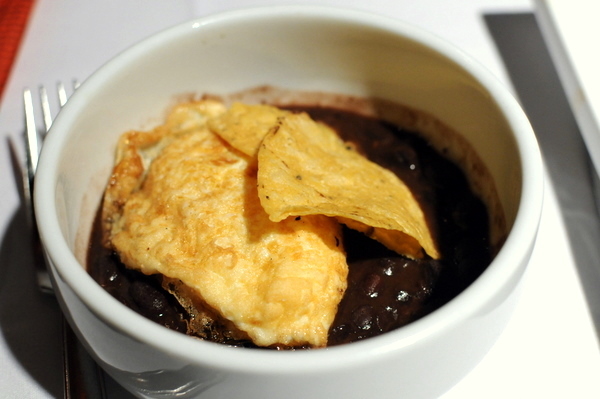 The egg in the beans course was an afterthought the egg here was critical to making the course. 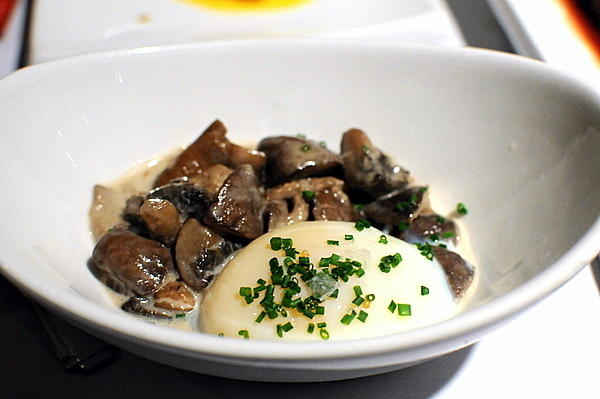 Cooked for an hour at 63 degrees the egg has a consistency between custard and syrup that enveloped the earthy mushrooms in a hearty warm coating of pure silken magic. Dessert looked laughably simple but proved to be quite delicious like a variation on a churro. The bread was toasted to a nice airy consistency while the layer of syrup was basically a rich cinnamon jam between the slices. The meal started out a bit lackluster and rushed, the both the quality and pace improved with time. By and large the food was very good and a couple of the courses were truly exceptional and at $35 a wonderful way to experience much of what Cafe Atlantico has to offer. 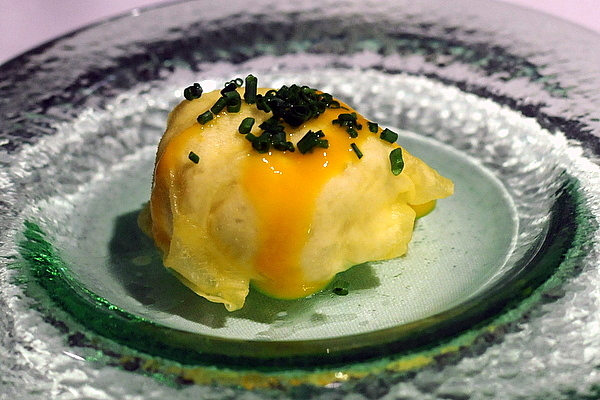 Though I didn't get a seat at minibar, the Latino Dim Sum proved to be a very enjoyable consolation prize which left me eager to try the dinner menu later in the week. Ris is the eponymous restaurant of chef Ris Lacoste, after a 10 year stint at the DC institution, 1789 Restaurant she's decided to be her own boss. Lacoste herself is a veteran of the DC food scene, after studying in France she returned and worked with Chef Bob Kinkead at a series of his restaurants including Harvest, 21 Federal, and Kinkead's American Brasserie. Chef Lacoste has also done stints at Vidalia, Eye Street Cafe, and Rock Creek at Mazza. Ris offers a new American style menu that focuses on seasonal ingredients and contemporary technique. When I made my reservation I asked if the restaurant had a tasting menu. Though the restaurant doesn't feature a fixed tasting menu, they told me to call back ahead of my visit and they would try to accommodate my request. 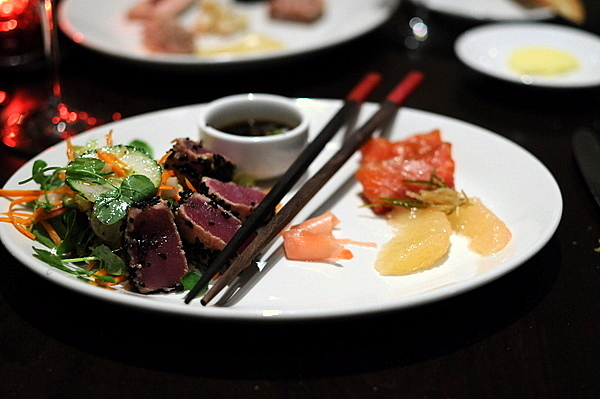 After researching the menu, I found enough intriguing dishes on the regular menu to make my own tasting of sorts. 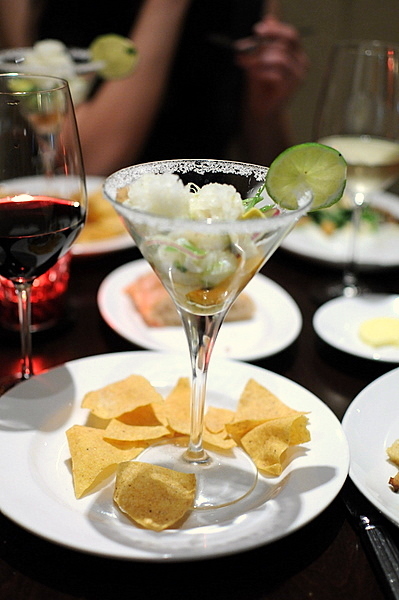 The Scallop Margarita was the ideal start, the lime and chilies give a ceviche like essence to the scallops while the tequila ice adds a bracing levity. Only the avocado felt out of place with a creaminess that felt disconcerting with the vibrant lightness of the rest of the dish. 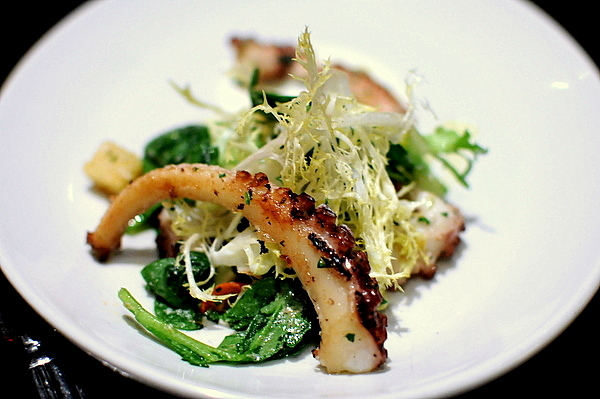 Recently I've been fortunate to enjoy several spectacular octopus courses. On the back of those experiences I've made a point to try octopus whenever I get the opportunity. The octopus was spot on and the combination of tangy and vegetal accompaniments provided a delightful levity that contrasted well with the heft of the cephalopod. For some reason crudos always entice me in theory and let me down in practice. The sesame tuna definitely falls into that category, fairly boring especially after the exciting noveau sushi from the previous night. 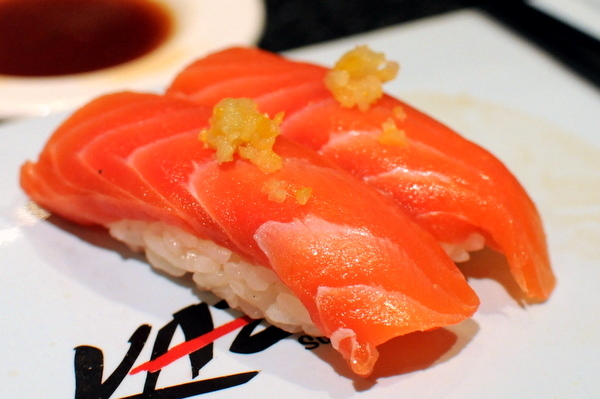 The salmon was better with an intriguing spicy smokiness and bright acidity. I basically ordered this to get a taste of the torchon and I wasn't disappointed, the liver was suitably unctuous and silky. The prosciutto was paired with a classic partner in melon though the use of watermelon was a bit unconventional. Unfortunately the lighter flavor of the melon did not stand up to the power of the meat. Last up was a pork rillette, redolent with savory porcine goodness and so naturally suited to the spicy mustard of the potato salad. 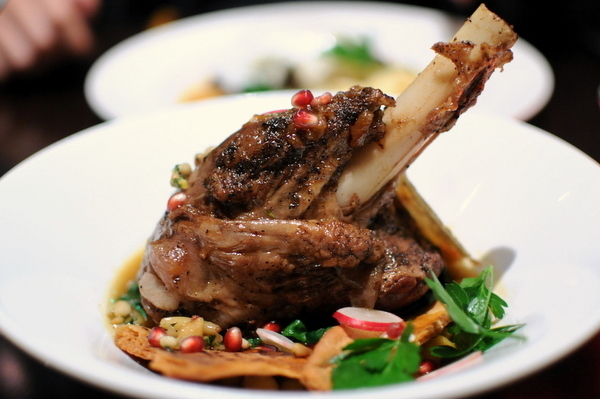 The lamb was wonderfully tender and literally falling off the bone. The flavor was surprisingly light particularly with the chick peas and pine nuts. The yogurt added a wonderful tang that broke up the monolithic feel of the lamb. By the end of the meal I was far too full to have dessert but I must say that the food exceeded my expectations. I considered having diner at 1789 but the restaurant and menu just felt so tired I couldn't bring myself to pay them a visit despite their reputation. Given Chef Lacoste's long tenure at 1789, I unfairly assumed that Ris would have a similar feel but I was happy to be proven wrong. 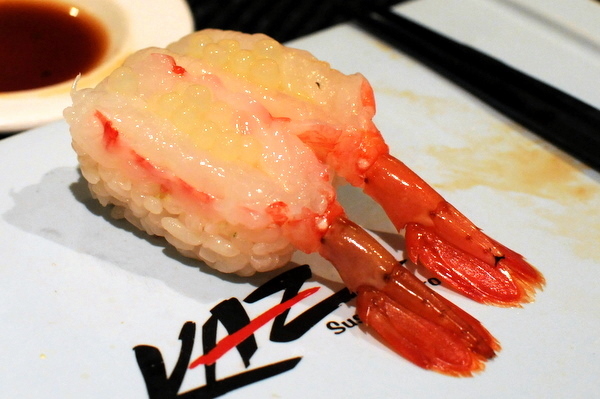 Kaz Sushi Bistro is one of the names included any discussion of DC's best sushi restaurants. 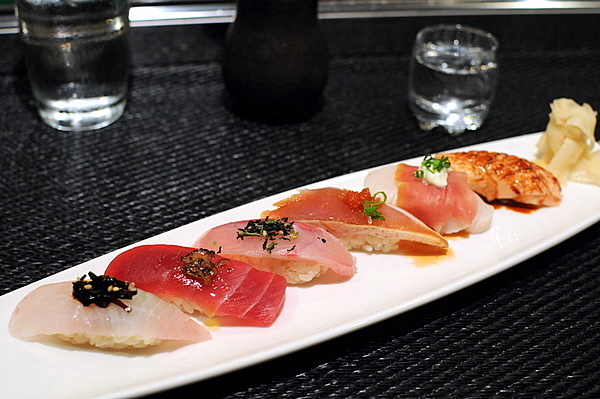 The chef, Kazuhiro Okochi worked at Sushi-Ko before leaving to open his own restaurant. 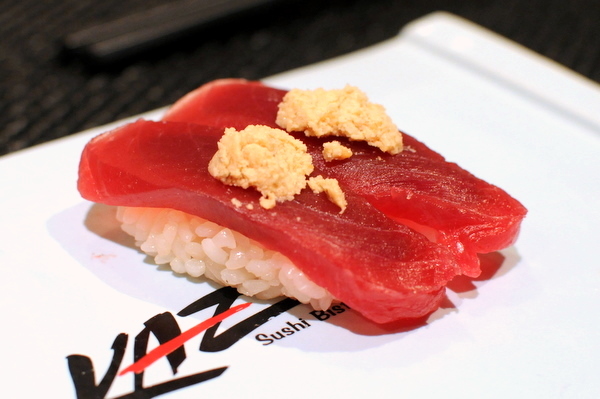 Kaz Sushi Bistro offers two different tasting menus, one focused on sushi and the other highlighting the restaurants mix of creative hot and cold appetizers. Given the dichotomy, I felt compelled to try both menus. I forgot the topping for the halibut but the fish itself was a touch soft though the muscular texture of the abductor fin more than made up for that. 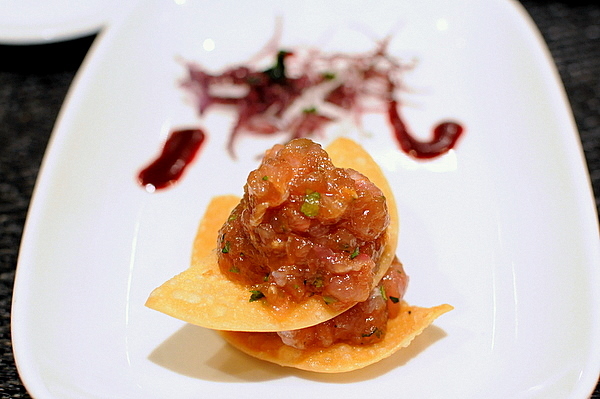 The tuna napoleon is Kaz's signature dish, the ground tuna comes mixed with onion and covered with a glistening sauce and the entire mixture rests on a savory crisp. The flavor and textural interplay between the fish and chip are enjoyable though not spectacular and the whole mixture is approachable enough that I can see how it has becomes the restaurant's signature. 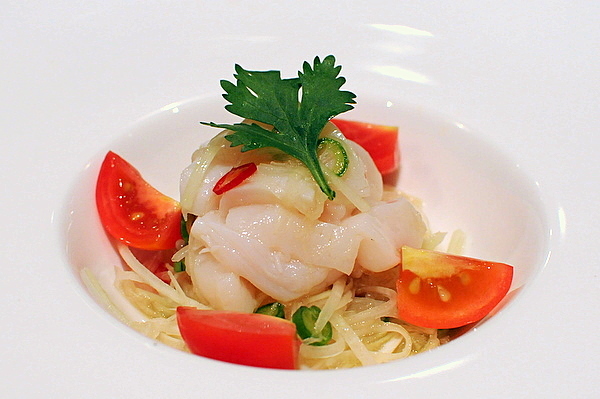 The scallop comes with a bed of pickled vegetables, fresh tomato, and chili slivers that add a potent combination of tang, spice, and herbaceousnes to the sweet dense bivalve. 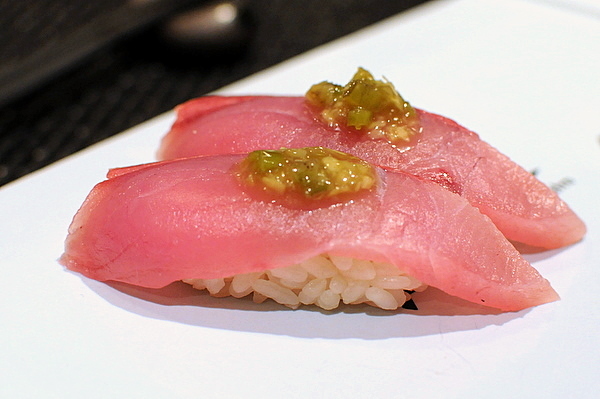 One of the most enjoyable pieces of the night, the yellowtail is firmer and oilier than the typical farm raised stock and the fresh wasabi sauce was strong enough to bring tears to my eyes. It was with this course I truly started to appreciate Kaz's creativity. 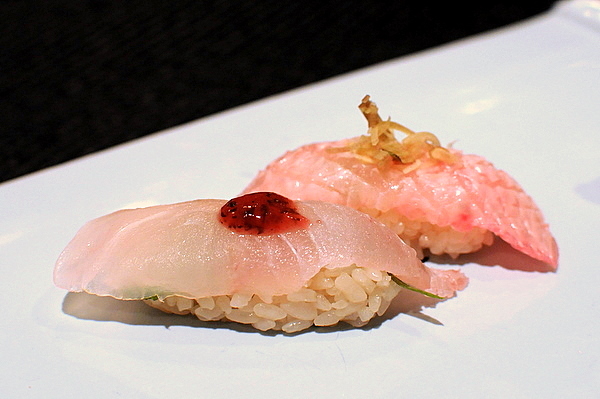 The ankimo was presented in two ways, as a pate wrapped in daikon and sashimi style with an ume gelee. The pate had a silky texture and gentle smoke complimented by the bracing bitter crunch of the radish. 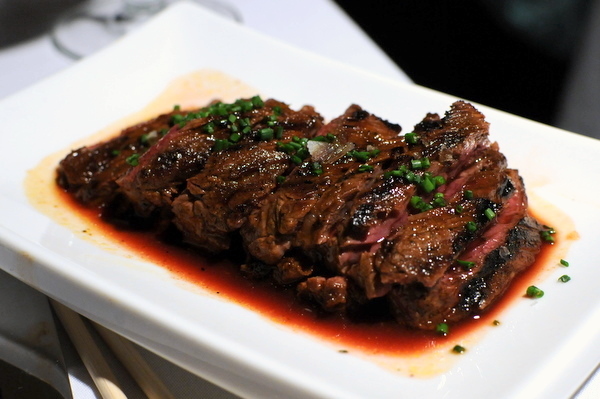 The second preparation was pure magic, the thick quivering slab of liver conveys a massive smoky sweetness gently kissed by a ripe stonefruit sweetness from the gelee. I was curious about this course from the start. 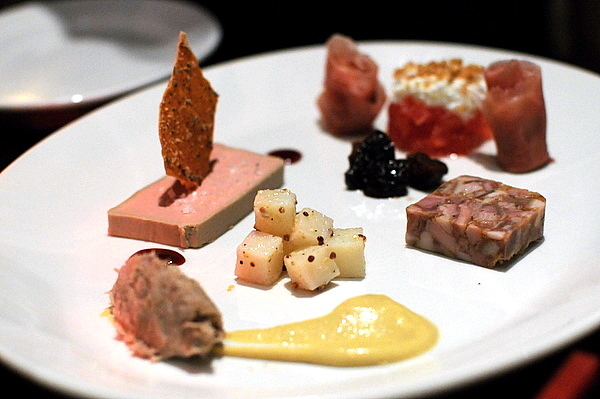 The foie gras has a consistency similar to a cream cheese albeit with a slightly richer mouthfeel. Though I didn't care for the texture, I did enjoy the way the fattiness enhanced the otherwise mild fish. 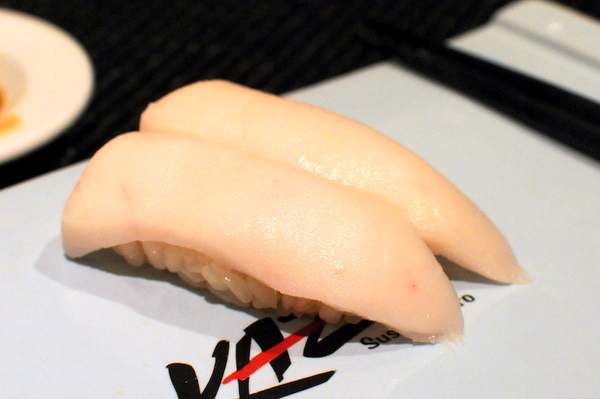 Called by several other names, this delicate white fish possesses a level fattiness on par with toro. 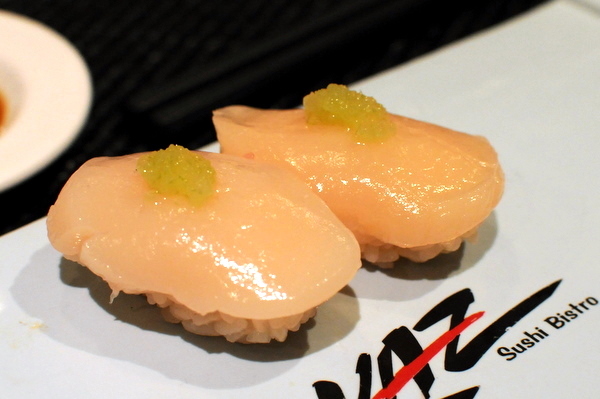 Kaz serves this without any adornment allowing the full flavor of the fish to come through. Next up was a lobster soup that just didn't do it for me. 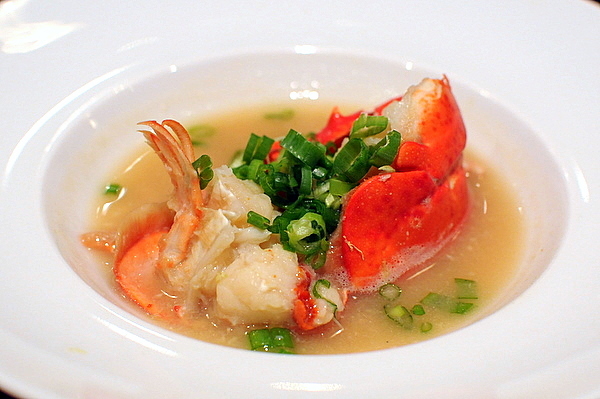 The soup was thin with a light lobster flavor and the lobster itself had a disconcerting texture similar to steamed fish. Aji has always been oe of my favorites and this exemplifies all the best qualities of the fish, dense, supple, and full flavored. I forgot the exact origins of this salmon but the fish was noticeably firmer and had a stronger brine than your typical salmon. 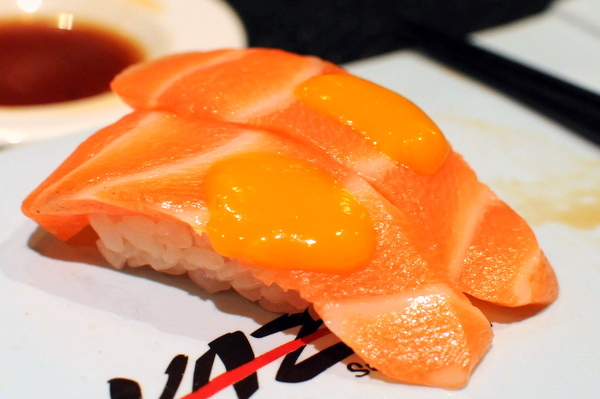 Salmon eggs are often an indicator of the quality of a sushi restaurant and these were superb, the chilled spheres burst with a clear scintillating brine. The addition of creme fraiche was a nice touch adding a pleasing thickness to the mix. Next up was a more traditional salmon topped with a sweet mango sauce, a daring experiment that didn't quite work for me but I still appreciated the creativity behind it. This was one of my favorite pieces of the night, though the shrimp looked just like a sweet shrimp, the chef called it a spot prawn. The yuzu caviar topping was one of the best pairings of the night though I would have liked it to have even more a of a presence. Next up was a trio of cooked dishes, though each was individually enjoyable the sudden onslaught of fried food was a bit much to take. The tilefish was flaky though it was the french fry like sapor of the potato that was the star of the dish. The crab was a touch oily but the backdrop of bitter greens helped temper the heaviness. 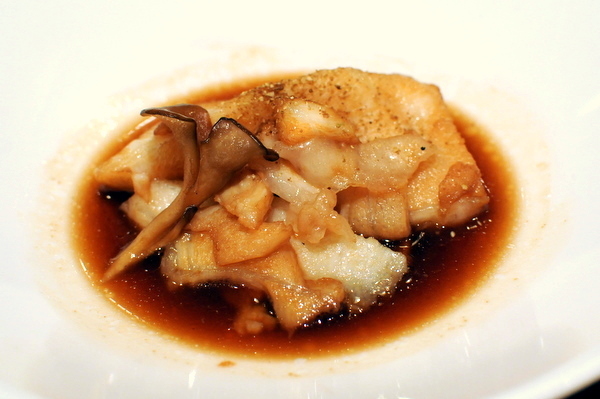 Last up was a fried cake of scallop and maitake where the earthy heft of the mushrooms was quite apparent. 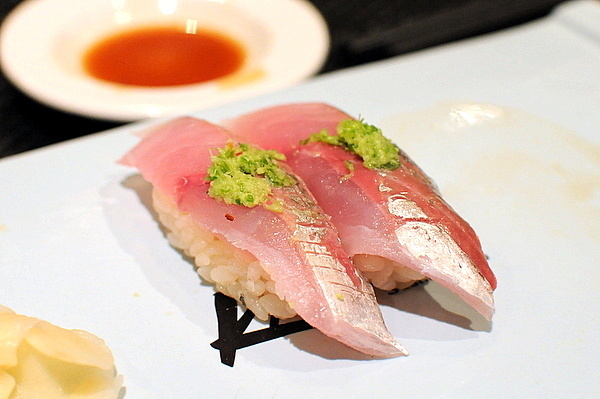 Mackerel is an oily and heavy enough fish on its own and the smoking only accentuated the fish's natural essence. 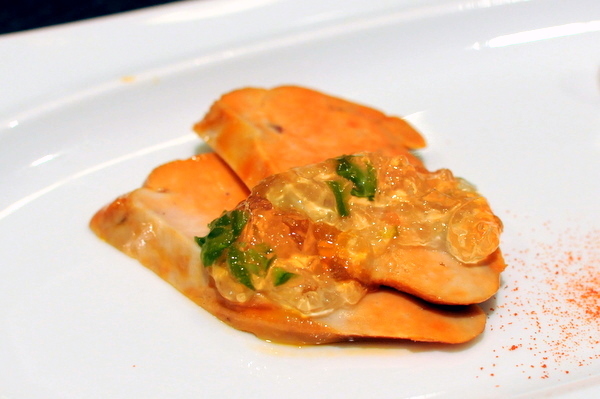 The plum sauce added a palpable ripe sweetness that was the perfect foil for the potency of the fish. 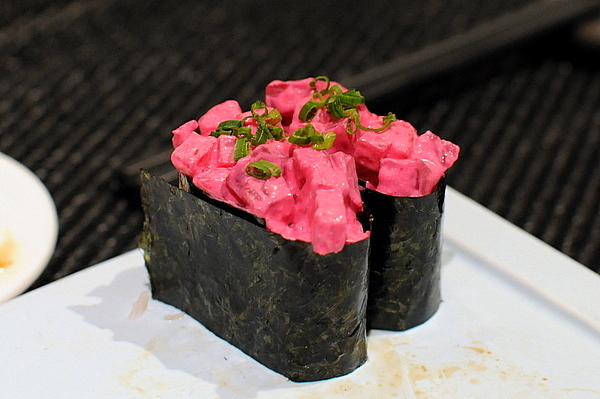 This might be the only restaurant I've ever been to that serves beet nigiri. Given my general disdain for beets I was expecting to hate this but the root vegetable sweetness of the beet was effectively held in check by the seaweed and soy. 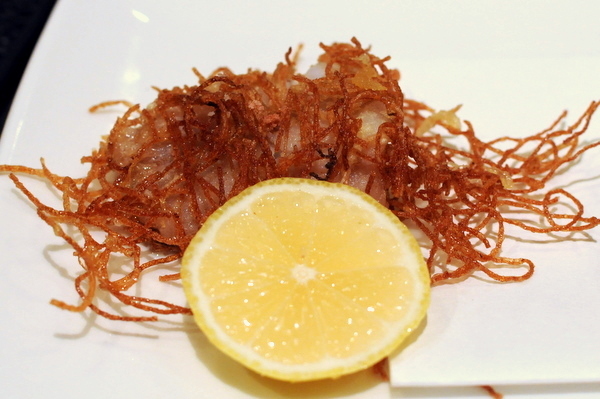 The bass is seasoned with a slightly sweet soy sauce, tender, flaky, and unreservedly rich. 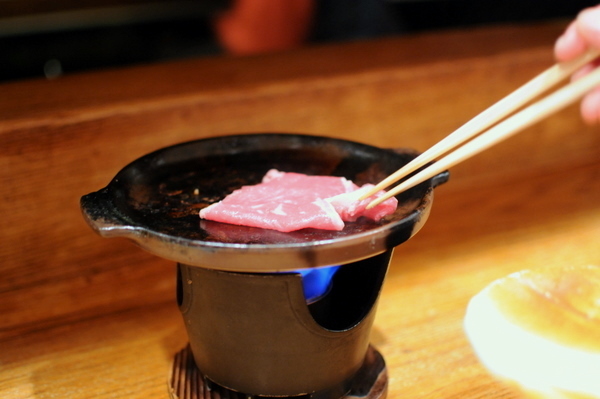 Though good, in contrast to some of the raw and cold dishes the hot food seems decidedly more conservative. The first thing I noticed about the squid was the delicate scoring on the surface used to tenderize the squid. The ika itself was spot on, firm and snappy with a yielding creaminess but I found the vegetal tinge of the olive disconcerting. Halibut with Pickled Seaweed - Though the fish was a bit soft for my tastes, I appreciated the sweet & sour levity of the seaweed. Tuna with Truffle - Absolutely superb, the truffle added a clear note of earth and musk but not so much that the fish was rendered invisible. Yellowtail with Wasabi Leaf - A very good yellowtail especially with the wasabi topping, but the standard hamachi just couldn't stand up to the sublime Hiramasa served earlier. Smoked Albacore - Kaz seems to have a penchant for smoking and he does so well, albacore has a clean flavor and texture very well suited to the woody essence of the smoke. 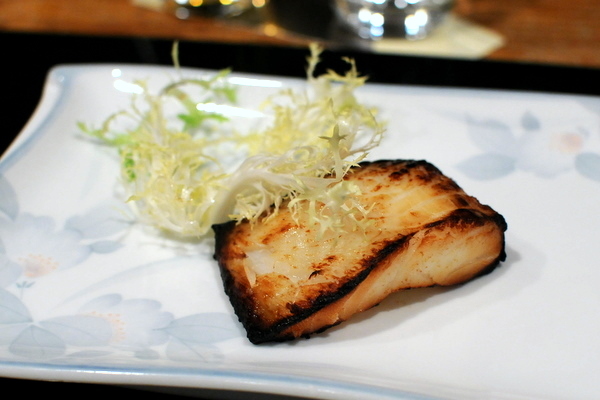 Seared Freshwater Eel - Quickly seared and covered with a light sweet sauce, simple and delicious. As I was served this dessert, Chef Kaz leaned over and said the secret behind the dish is that he picked the peaches personally. 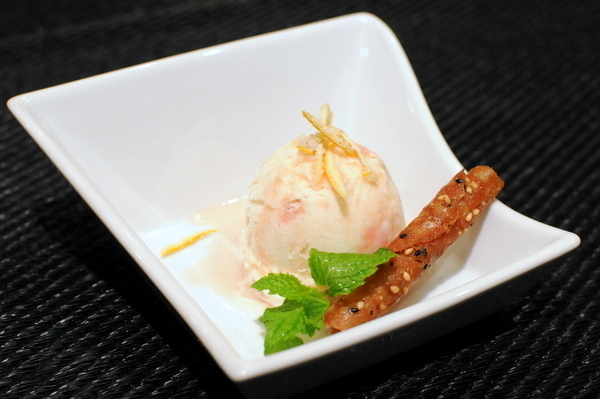 The sorbet tasted remarkably fresh with a light sweetness, perfect against the caramelized nuttiness of the tuille. 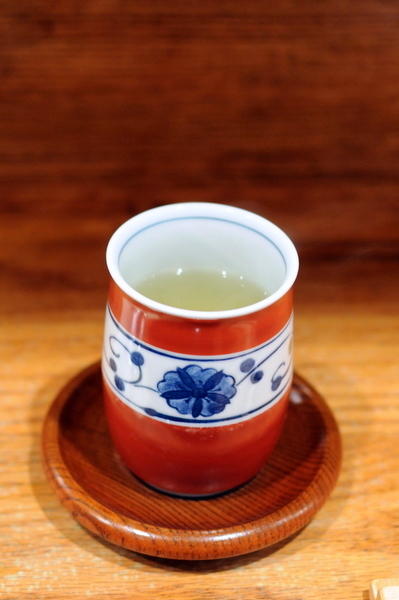 At the end of the meal, the chef offered a delightfully chilled shot of plum wine as a digestif. Kaz shows an unconventional flair especially when it comes to his sushi; rather than relying solely on traditional condiments like sushi and wasabi, Kaz uses an array of whimsical accompaniments. 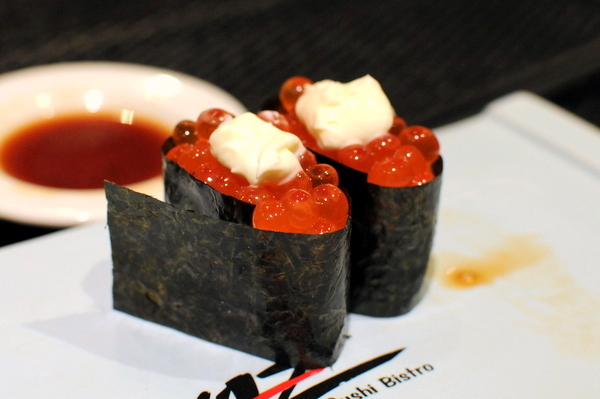 I enjoyed both menus though the Ultimate Sushi is probably the best way to experience Kaz's cuisine. 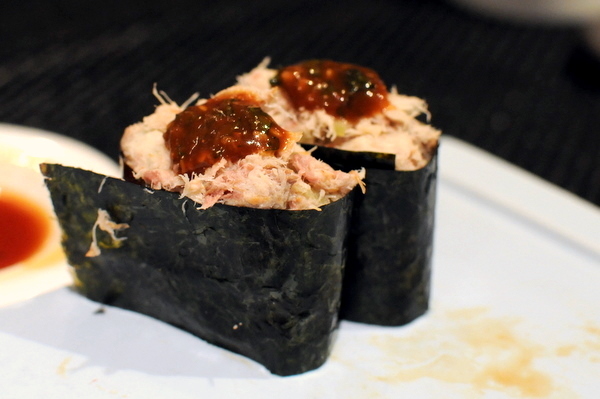 Kaz Sushi Bistro certainly made a very compelling case for why it should be considered DC's best sushi.